Spelling Lesson: Let’s Start Scratching! 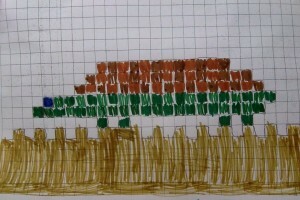 Lately in maths, we have been revising the chunking method for addition. The chunking method involved chunking – or splitting – a number into its tens and ones to allow for easier mental computation. All the students practised this method in their books before creating a presentation on the iPads. For more presentations, head to our students’ individual blogs. Lately our students have been working on jazzing up their “All About Me” pages, so their page visitors are interested by the content they read, and are hopefully more likely to leave a comment, thereby starting a global conversation! All of our students researched a joke and created a Voki to speak the joke on their page. 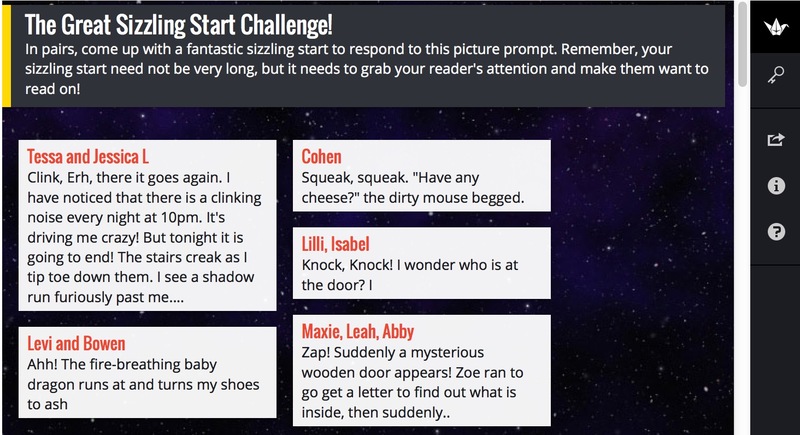 A learning by-product of this activity was about punctuation: unless we type our text with correct punctuation, the Voki (after all, they’re only as smart as we make them!) won’t speak the joke intelligibly… We had to think hard about full stops, commas, spaces and general spelling… an excellent exercise in literacy. For more laughs, head over to our students’ blogs and go to their “All About Me” pages! After lunch everyday my class has jobs to do: 4 people go out to other classes to get fruit scraps and recycling. They take the fruit scraps to the chickens and they take the recycling to a special sack. 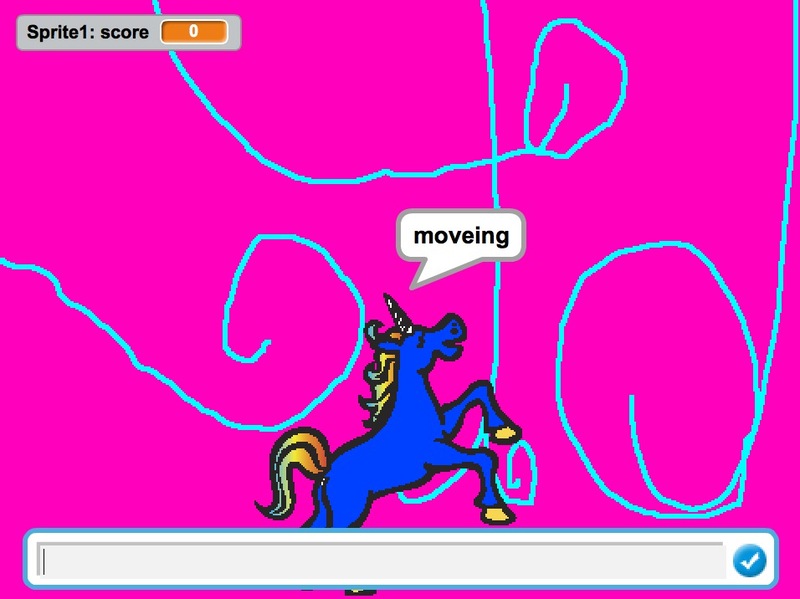 Meanwhile the others read or draw things they like. Recently we have been drawing pictures to put on our “All about me” pages on our blogs. 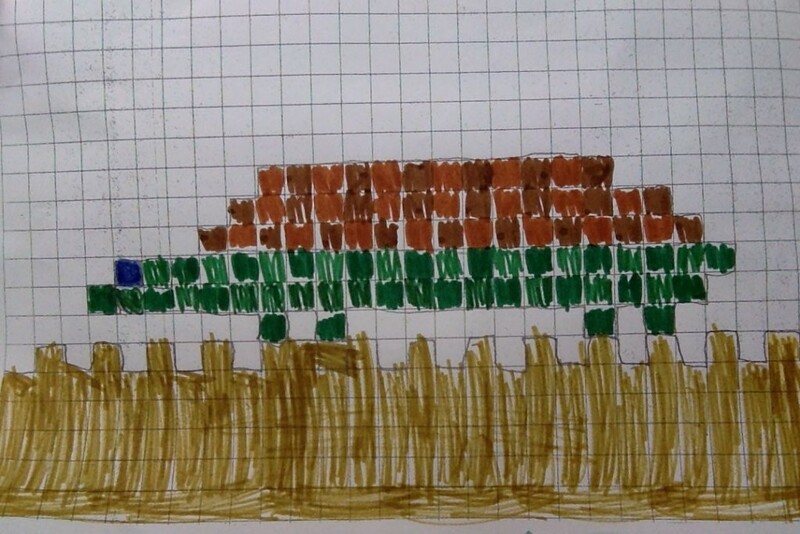 This is my “pixel turtle”! Come visit our blogs and read our “All About Me” pages. On Tuesday last week, our class and the UP class participated in an interactive presentation called “Being A Good Bystander”. This presentation was organised by Cybersmart in the context of Safer Internet Day. 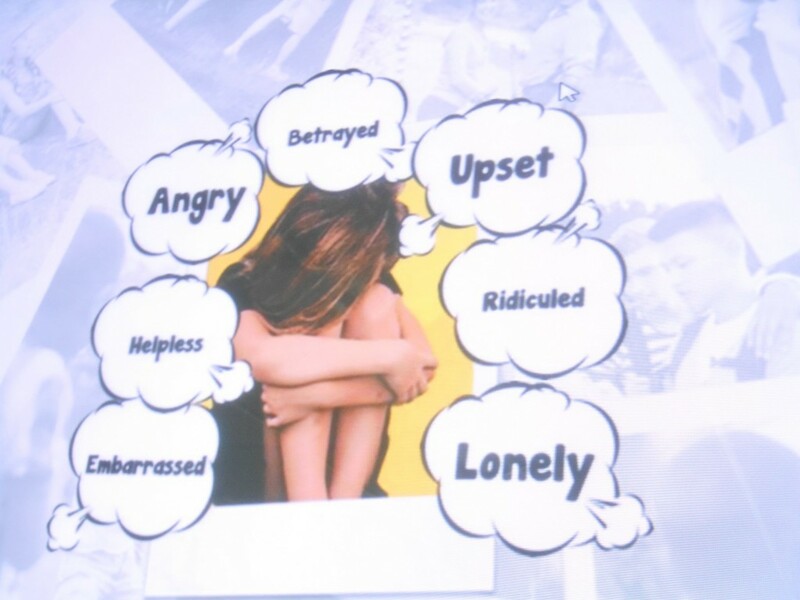 There were approximately four other schools that were connected at the same time as us, and the presentation was interactive because we got to contribute our thoughts about a range of cyberbullying scenarios. That photo was not a good look! After the photo was taken, it was uploaded to a social media site and at that stage of the presentation, we had some time in our Yahl group to predict what would happen… We guessed right: the photo was going to be shared by many people until it went “viral”. Lots of people also commented on it, and the comments for the most part weren’t very nice. How would you have felt if this had happened to you? 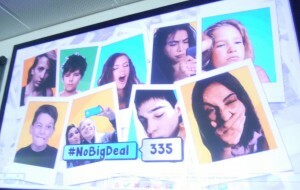 #nobigdeal: bad selfies went viral! The bystanders decided to take some “bad selfies” and started sharing them on the Internet with the hashtag “#nobigdeal”… and all of a sudden, it became cool to have bad selfies on your site! The message from the presentation was loud and clear: if you’re a bystander to a cyberbullying situation – or any bullying situation – you can make the right choice and work actively to stop the bullying. The solutions we were shown on the day were very appealing because they came from kids, and they were very creative, and humorous. The students are really keen to incorporate the idea of the Pink Shirt in our upcoming anti-bullying day… see what happens: we might have a sea of pink shirts later this month! Following this session, the students spent two lessons working in mixed MP/UP groups on some “Being A Good Bystander” comic strips that they planned and created on the iPads, using the app “Strip Designer”. Unfortunately, we won’t be able to show these on the blog, as our faces can’t be published! This week for our class blog we had to go onto the internet to do our Avatars. There are so many different sites to go on to do your own Avatars. Doing the avatars was so much fun. You can choose your own avatars and get to customize the look of your avatar. The reason we did avatars is because we didn’t want to put our identity up on our class blog. 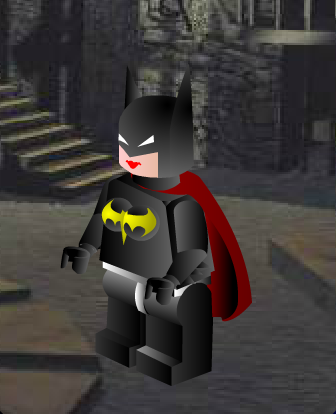 I chose a lego avatar. Most people in the class chose them. Going Global – The Magazine! 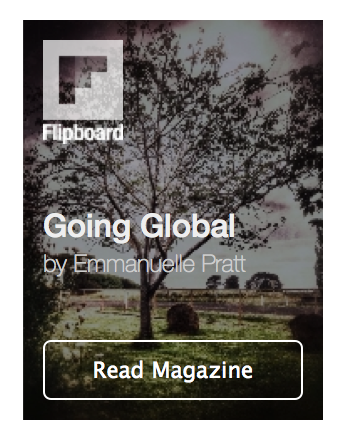 The technology we have at our fingertips, and the incredible possibilities offered to us never cease to amaze me… Here we are, 8 months into our first blogging experience, and we actually have created our own magazine, thanks to “Flipboard”. Do click on the image above, or on the widget on the left hand side, and you’ll be taken to our very first Going Global magazine. 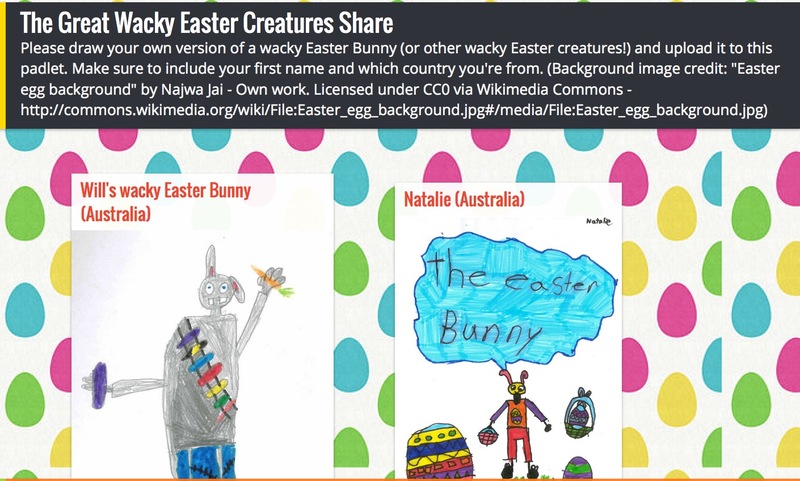 In this very special edition, you will find a selection of the most exciting blog posts from our class blog: exciting because they corresponded to milestone events for our class… our excursion to see the amazing Chooky Dancers, or when our class poem was first published… there were many such thrilling moments in 2014. The magazine also showcases posts from each of our students. The posts have been selected to show the variety of media that the students have learned to use this year, to create interesting and stimulating content. As this year draws to an end, I’d like to thank the amazing and tireless educators who make blogging such a rewarding and stimulating experience for students and teachers worldwide. My heartfelt thanks go to Sue Wyatt, who organises the wonderful Student Blogging Challenge, and to Julia Skinner, the creator of the ever-inspiring 100 word challenge. Piper: Endangered Animals – An Issue I Care About! Hello this post is about endangered animals.This is to make people more aware of the animals around them so they can keep them safe. 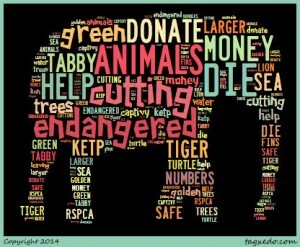 Here is a short list of some endangered animals. There are many more so in this post I will try to tell you about how we can help save some endangered species . One thing we can do is to recycle old and unused objects to stop cutting down trees. People are catching sea animals in big nets and cutting the fins or tails off and putting them back to die in the water.Another way we can help is to donate some money to groups that are trying to help endangered. If you have art enthused children maybe they could make rock pets or make a twig person this is good because then we are not making pollution to harm the animals territory.We can also walk or ride your bike to school to stop pollution in the air. I hope that you take every thing into account when you buy something next so you can try and make it recycled. Our Halloween Monsters Project is finally completed! We had lots of fun creating monsters, writing descriptions about them, and exchanging descriptions with our buddy class in Lisle, Illinois. Each student had to draw their buddy’s monster from its written description. The movie below will show you the results, which have been really interesting! – It is very easy to take details for granted when we describe our pictures, and unless we put ourselves in our buddies’ shoes, we will forget to mention some important information… with hilarious results! Hi this is my incredibox I hope you enjoy it! 100WC Special Showcase: Congratulations Harry H and Hamish! 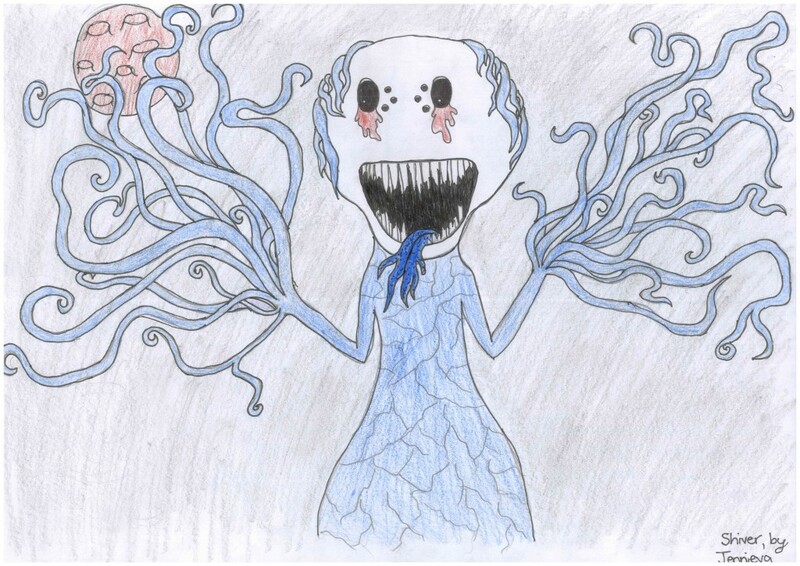 Congratulations to Harry H and Hamish, whose entries were showcased for week 11 of the 100 Word Challenge. The prompt for that week was the word “Remember”, and the theme was that of Remembrance Day. Both boys chose to write a poem (as did many others in the class). Mrs Diestler from the 100WC team thought that Harry’s word choices created “an engaging, mysterious and beautiful piece”… check out Harry’s poem! If, like Mrs Diestler, you were touched by Harry’s words, don’t forget to leave him a comment! “I will remember, the day in November When the noise of the gunfire did cease…” Read Hamish’s elegant poem, and leave him some feedback – he’d appreciate it! To read all the inspiring entries that were showcased for week 11, head here. Harry R, a current student in Year 5, has interviewed his Dad and his Pa, who both went to Mil Lel PS. Harry’s Dad attended from 1977 to 1984, and Harry’s Pa was a student at Mil Lel between 1942 and 1949. Click on the file below to listen to Harry’s excellent interview and discover how things have changed in the span of 3 generations at Mil Lel Primary School! 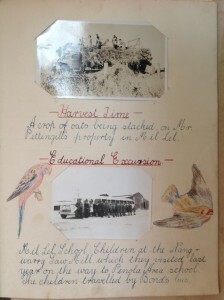 This week, the Student Blogging Challenge was all about schooling… And we got really inspired! We’ve got a few creations in the pipeline that we will be posting next week… Watch this space! Yesterday some children from our local High School came to visit our school. These children have English as their second language, their original languages being either Karenni, Filipino, Thai, Arabic or Burmese (some of the students even spoke two!). We had a great morning, first of all we showcased our Jump Rope For Heart skipping team and then did a workshop on skipping. They were actually quite good at it, even though they’ve never done it before! We then went on a website called Storybird to create a book of their choice to help increase their English skills. Most of the books ended up being about soccer for that is most of these students’ greatest interest. Finally we all played a great game of soccer with the soccer ball we presented them that was signed with our names. The teams for the game was us versus them, and even though there was more than twice as many of us than them, the game was still a draw! It was clear that they were outnumbered and we were outskilled! It was a fun and enjoyable day and all of our class and their class are looking forward to catching up again in three weeks. We were in awe of the beautiful and complex script used in their languages in written form; some phrases such as “Hello” and “How are you?” were written on our whiteboard and we are going to try and learn to say “Hello” in the five languages so we can impress our visitors next time! Our visitors wrote the above greetings on our whiteboard. Below you can see an example of one of the books we created on Storybird. This book was created by Jancy, Per Kaw, Wade and myself and is all about… soccer!